— Eric Toone, chemistry professor and entrepreneur who now leads Duke’s Innovation & Entrepreneurship (I&E) Initiative. Seven people directly involved with the initiative — trustees, professors, administrators and alumni — spoke with Duke Today’s Keith Lawrence about the role of entrepreneurship at Duke and beyond. Here is what they said about five key questions. Why is Duke placing such a strong emphasis on I&E? A university can translate ideas into real things and actions that make a difference to people’s lives. Entrepreneurship is a way to apply knowledge in service to society. Eric Toone: I have a very strong sense that the university’s role in society is changing and evolving to a place that still creates knowledge and still sees that as a primary focus of its life, but with an expanded core that includes the translation of that knowledge. There are no more Bell Labs, and we see more and more big corporations downsizing research or doing away with it all together, so where does innovation come from? I think increasingly it’s going to come from the university That belief is the animating philosophy for what we’re trying to do here — seeing the university as a place that takes the ideas that grow here and turns them into real things and real actions that make a difference to people’s lives. Eric Toone has led Duke’s I&E Initiative since November 2012. He is a Duke chemistry professor and entrepreneur who for two years helped build and then lead the U.S. Department of Energy’s research incubator. David Robinson: I think we’ve already seen that having a more diverse set of interests in our student body makes for a richer student body. If you think about this idea of knowledge in the service to society, entrepreneurship is a mechanism for bringing that about. It’s a way of taking an idea and translating it into action … and that will help the university live out its mission in the community better. David Robinson is a Fuqua finance professor and the J. Rex Fuqua Distinguished Professor of International Management whose expertise includes entrepreneurial finance and private equity. He is heading up the research component of I&E. Aaron Chatterji: The students are everything; they’re the secret sauce to all of this. If we can keep getting the quality students who are choosing us year after year, and direct their attention toward trying to build companies to solve huge global problems, Duke’s going to be a fantastic place for years to come. Aaron Chatterji is a Fuqua associate professor who previously worked as a senior economist at the White House Council of Economic Advisors on policies relating to entrepreneurship and innovation. David Rubenstein: If we’re going to be a leading university in the next 5, 10, 15, 20 years, we need to be at the forefront of things like innovation and entrepreneurship because other universities are going to do the same thing — and they should. We are a country where entrepreneurship is very highly valued. I think one of the great things about this country is we do value people getting their own ideas and starting new companies. Other societies don’t have quite this spirit. So we have to make sure we play to our strengths, which are encouraging more people to be innovators and entrepreneurs because that’s the lifeblood of our country. David Rubenstein T’70 is the chair of the Duke University Board of Trustees. The co-founder and co-CEO of The Carlyle Group, one of the world’s largest private equity firms, he donated $15 million toward the I&E Initiative. 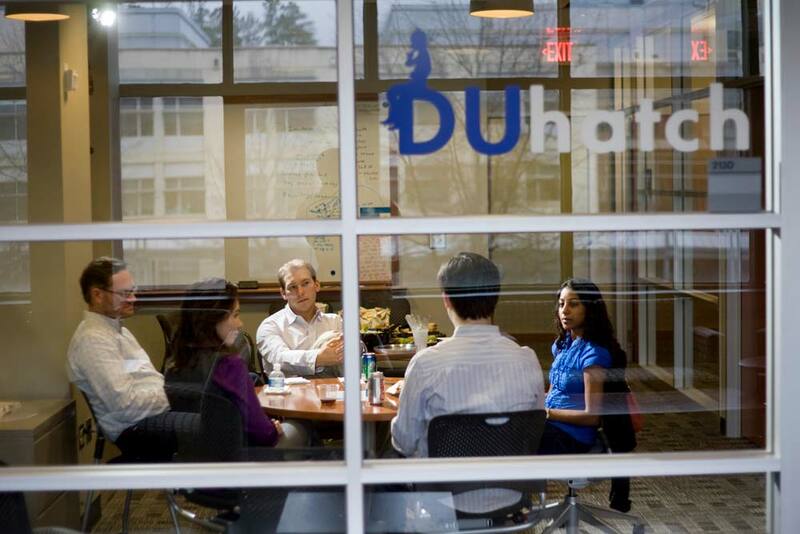 DUhatch is an incubator that helps Duke students transform innovative ideas into viable business and social ventures. It is located in the Pratt School of Engineering, but open to all students. Why is I&E considered to be so important to the U.S. economy? Brandon Busteed: Since the U.S. government began tracking new business births and deaths in the early 70’s, we’ve always run a surplus of about 100,000 more new business births than deaths as a country. In 2009, that literally crossed over. Now we’re officially running a deficit. … I don’t care what you’re interested in, the stock market, whatever, I can’t think of anything more scary for our economy than that simple fact alone. Duke’s got to get this right. Not just for Duke. We’ve got to get it right for how we think about our U.S. economy and then you take that across the world. If we want to fix problems in Egypt or Tunisia or wherever there’s unrest in the world, you can literally boil it down to how many young people don’t have a job. Entrepreneurship at Duke is a world-saving initiative, which gives us a lot of impetus to do something big with it. Brandon Busteed T’99 is executive director of Gallup Education, which researches how to connect education to job creation and is involved in I&E’s research efforts. As a social entrepreneur, he has founded two companies and a nonprofit. Eric Toone: Since the end of World War II, most — and by some counts all — net job creation has come from young companies. It’s important to phrase this properly. It’s not small companies because, of course, most small companies are a gas station, a plumbing business. But it is young companies that are the ones that are growing. Young companies are the ones that are creating jobs. That has been quantified. 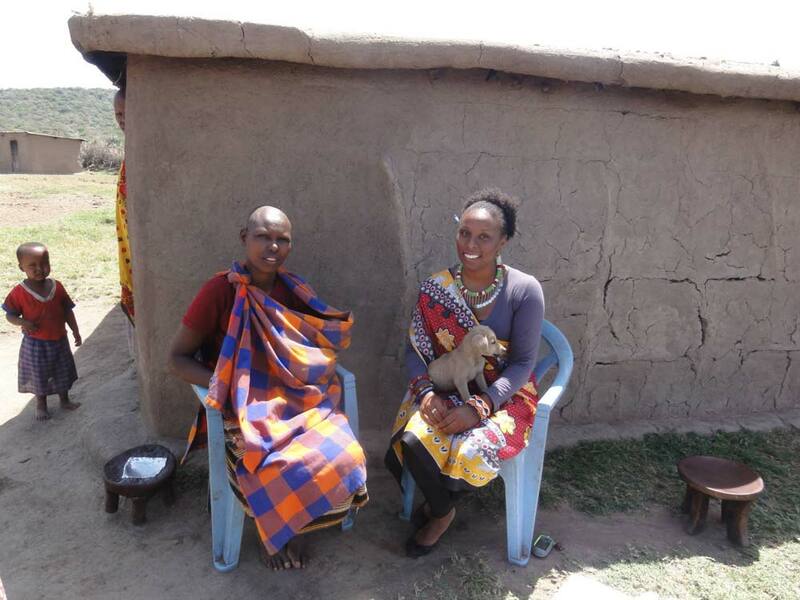 Alexandra Sutton (right), a graduate student at the Nicholas School of the Environment, is part of a social enterprise project (Kedge) that provides business education and conservation training to rural communities in Eastern and Southern Africa. The school offers a certificate program in environmental innovation and entrepreneurship. Why is Duke well-positioned to be a leader in the field? Kimberly Jenkins: Entrepreneurship is a team sport and it’s really interdisciplinary. That is Duke’s strength. [Also,] creativity is the foundation of all this and we get creative kids. You just have to put some courses, internships and intensive programs like Duke in Silicon Valley out there for them. We have great faculty, staff and alumni that enthusiastically put it out there for them. Kimberly Jenkins, a Duke alumna and former trustee, created and launched the I&E Initiative in 2010 and led the initiative through mid-2012. Today, she heads up the Duke in Silicon Valley Program that is part of I&E. Brandon Busteed: Of the current 6,000 undergrads, how many are going to start a business during their time at Duke? 60? OK, that’s interesting. Maybe we can get that to 160. But of the 100,000 Duke alums, there might be 10,000 who started a business. I mean, I started one two years ago. My co-founder, who’s the CEO of the company, she’s a Duke grad. What did she tap into? The Duke network, just like I did. I just think it’s real exciting to think about Duke not as this fixed four-year time in our lives. With this thing called entrepreneurship, there’s a thread that you can pull from — the pre-Dukies all the way through the alumni — that allows me to tap into anything from capital to networks to mentors. … With a serious commitment capital-wise and leadership-wise at Duke, this thing can take off. It’s always been in Duke’s DNA. David Rubenstein: Every time I talk to young students at Duke, freshmen, sophomores, people who are not yet seniors, they are really excited about the prospect of what they can learn at Duke, how they might become entrepreneurs in the business or social area. And I think there’s a spirit at Duke that I think is different than at other universities. Obviously Stanford has this as well. I think on the East Coast, Duke can rival what Stanford has done. The Research Triangle is a base, but we can do more in downtown Durham, we can do more on West Campus. I do think that the spirit of being an entrepreneur is something that we want to have permeate the campus at Duke, and I think it’s a very important part of what goes on at Duke. David Robinson: If you look at what other universities are doing, there are a great many business schools out there operating some kind of venture capital, private equity or entrepreneurship center, but these things tend to be housed inside business schools, which means they have limited ability to touch other parts of campus. I think one of the things that’s really cool about the initiative is the fact that we have connections to the entire university. All the schools. I think through these connections it is going to be possible to really distinguish ourselves by the interdisciplinary nature of the kind of work we’re able to do. 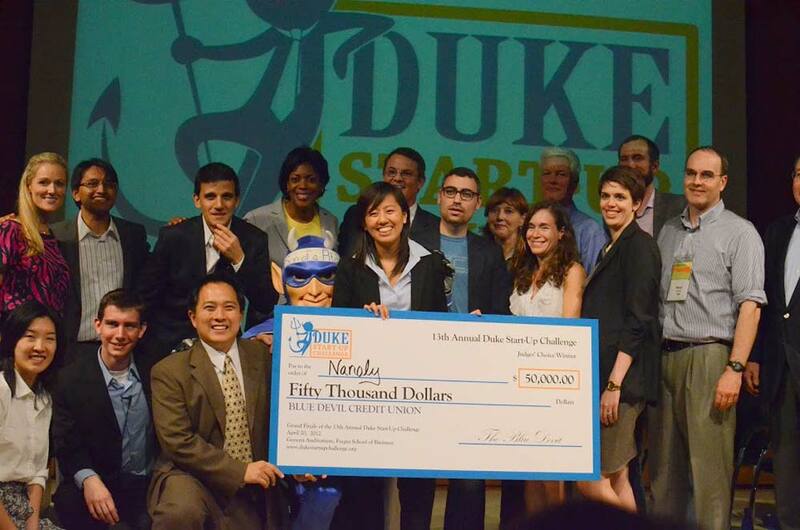 The Duke Start-Up Challenge is an entrepreneurship competition started by Duke students in 1999. The winner receives $50,000 and participants get to network with Duke alumni entrepreneurs. More than 100 Duke teams competed in 2014. Duke’s initiative includes a research component. What kind of things do you hope to learn from this research and how will that benefit students? David Robinson: One of the things we want to ask is can entrepreneurship be taught. If so, what kinds of personality traits and aptitudes in the people who are receiving the education are most important for helping that education stick? What are the right ways to teach people entrepreneurship? I think another important question is whether incubators and accelerators actually help the companies that come through and, if so, how can you do that better? There are also a lot of policy questions that are important to try to study, like what’s the connection between innovation and entrepreneurship and inequality. We see correlations between entrepreneurial processes and things like economic growth, but we don’t completely understand the mechanisms by which new business creation fosters growth. Eric Toone: The average successful entrepreneur is someone who’s older and I think there are a variety of reasons for that: They have more life experiences, they perhaps experienced failure and learned the hard way what doesn’t work, they had better networks. But I think a good part of it is they have better ideas. It takes time for people to accumulate ideas. Some of those kids have great ideas. There might be another Mark Zuckerberg or Bill Gates here at Duke. I certainly hope there is. But most of the kids don’t have a great idea right now. What we’re going to do is to use the ideas they have today to teach them how to take an idea and do something with it. Then when they arrive at a point in their lives where they do have a great idea, they’ll know how to do something really special with it. 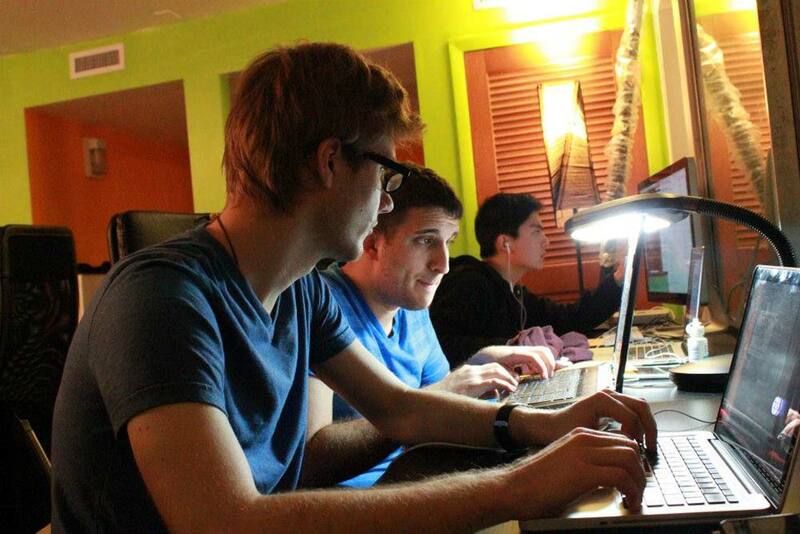 TheCube is a selective living space for entrepreneurial students at Duke. It also provides resources to support start-ups, including events and some collaboration space. What would you like to see from Duke’s I&E Initiative 5, 10, even 20 years from now? Arti Rai: I would love it if the law school’s Center for Innovation Policy and the I&E Initiative were seen as the go-to place for policymakers in DC to get unbiased, impartial but also practical advice on legal and regulatory questions surrounding the promotion of innovation and entrepreneurs. I do think the startup ventures clinic and I&E are very interested in having the ability to say to entrepreneurs, “Look, we are the one-stop shop for all of your legal issues essentially, not just IP, but everything.” That would be fantastic, and to then have our students working in that context would be terrific. Arti Rai, a Duke law professor, co-directs the Duke Law Center for Innovation Policy. From 2009-10, she was the administrator for policy and external affairs at the U.S. Patent and Trademark Office. She is advising I&E on intellectual property and patent issues. David Rubenstein: In the last five or 10 years, we’ve completely changed the education model in universities and it will change even more so in the next five or 10 years. What you want to do is get students to come in, think that they’re not only going to have to get grades and study but they are going to get life experiences. They can learn how to be an adult in the business world or in the social entrepreneurship world. So I think Duke has to be at the forefront of that if we’re going to be a leading university. 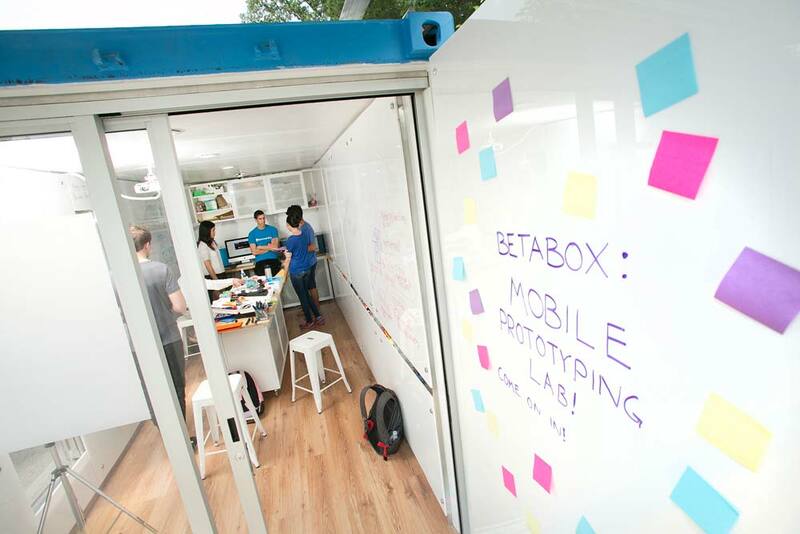 Duke’s Innovation Co-Lab recently brought a Beta Box Mobile Creativity Lab to campus to introduce new students to the entrepreneurship community, expose students to high-end equipment such as 3-D printers and gauge student interest in this kind of space. Beta Box photo by Les Todd, Duke University Photography. All other photos contributed by profiled programs.